Wow did you see that beefcake? He was totally a gladiator! So, they might not be thrown in the Colosseum to fight any more, but those burly boys still need a little protection. 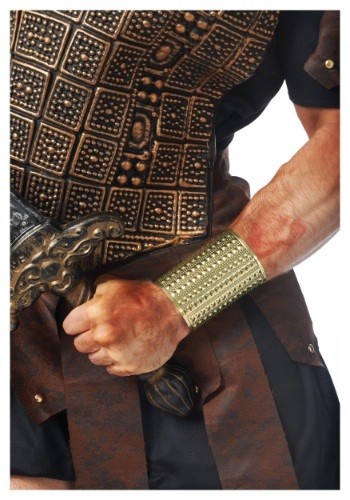 The hunky gladiator needs his sword, a hot bod, and wrist guards for fighting off dragons (or whatever they fight off). Their mission is different every time. Some days it's helping people retrieve cats from trees, others it is fighting off evil. The days of gladiators are full of adventure. The Men's Gladiator Cuff is the perfect accessory for your next gladiator costume. Whether it be for LARPing or just Halloween the metal gold colored wrist cuff is a perfect accessory to show off your skills. Pick up your sword and helmet and get ready to impress with your sweet gladiator look.